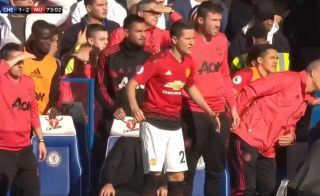 Manchester United fans love Ander Herrera a lot for a player who isn’t even a regular in the side – and it’s video clips like this that make you see why. The Spaniard was preparing to come on against Chelsea yesterday when Anthony Martial scored his superb second strike to put the Red Devils 2-1 up at Stamford Bridge. Watch the Herrera video below as he celebrates like a true fan as he watches the goal go in from the sidelines. United fans would no doubt love to see this passionate performer get on the pitch a little more often, especially as question-marks remain over the likes of Paul Pogba in that area this season.